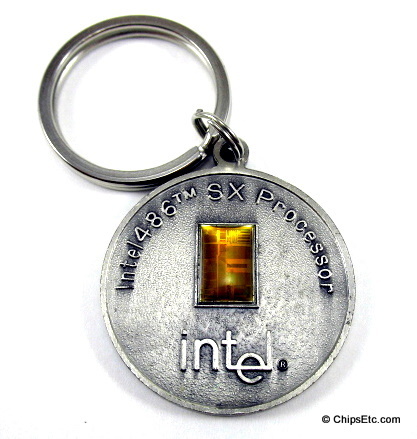 This metal keychain is from the "Sand to Circuits" collection, Pentium Processor jewelry was designed exclusively for Intel's "Sands to Circuits" gift collection. 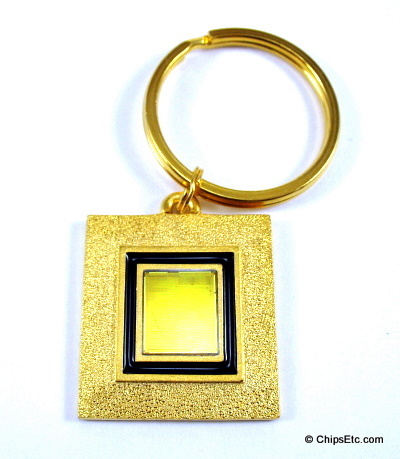 Gold plated keychain with embedded Intel Pentium processor surrounded by black color enamel. 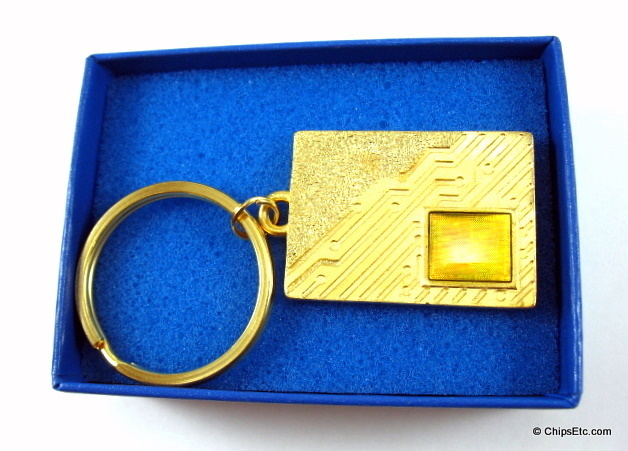 Another gold plated keychain from the "sands to Circuits" line featuring an actual Intel Pentium Processor and circuitry design. Comes new in a blue gift box with Intel logo on top in white lettering. 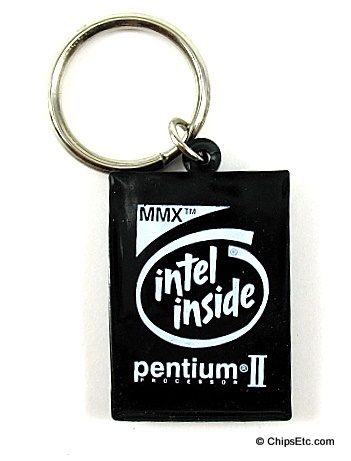 Pewter keychain with a Intel Pentium CPU die mounted on it. Part of Intel's "sands to circuits" jewelry collection, it features a nice circuitry design. A member of the Intel i960 family, the Intel 80960KB chip was an embedded 32-BIT microprocessor with Integrated Floating-Point Unit and High-Performance Embedded Architecture. ​This CPU featured 25 MIPS Burst Execution at 25 MHz, 9.4 MIPS Sustained Execution at 25 MHz, and had 512-Byte On-Chip Instruction Cache. The Intel 80960 microprocessor was available in 132-pin ceramic PGA packaging. 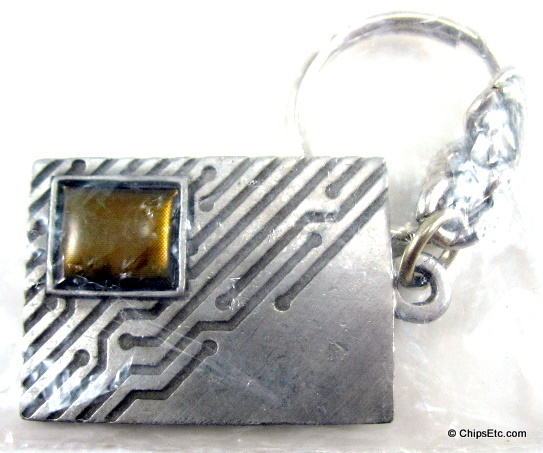 Super rare, this lucite keychain has an actual 80960KB microprocessor chip inside. New and unused. In 1996 Microsoft and Intel announced plans for the Windows CE operating system to run on low-power x86 and Pentium-class processors. The first Intel chip to support Microsoft's new Windows CE operating system for hand-helds was the Ultra Low Power 486SX, also known as Hummingbird, and was also previously deployed in non-CE hand-helds in Japan. This is an extremely rare key chain. It was only issued to some Intel employees in the division working on the low-power "Hummingbird" 486 processor for embedded applications--and was never sold to the general public! This keychain is metal and features an actual Intel 486sx 25mhz "Hummingbird" ultra-low power chip mounted on the front. 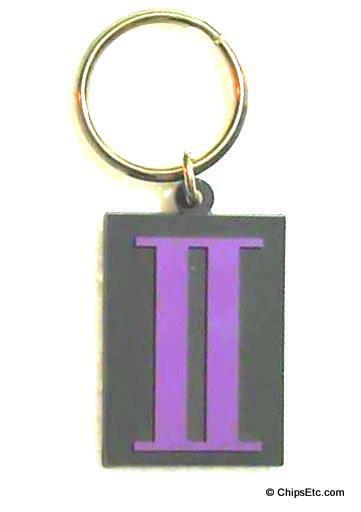 Soft black rubber Pentium II processor keychain has the "II" logo in purple on one side and Intel Inside MMX/ Pentium II logos on the other. Measures 1 3/4 x 1 1/4 x 3/16". Intel's 28F020 CMOS flash memory added electrical chip-erasure and reprogramming to EPROM memory technology. 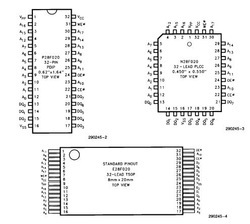 The 28F020 is a 2048 kilo-bit nonvolatile memory and was packaged in a 32-pin DIP (PDIP-32) as shown in this item. Other package options included a 32-lead PLCC and a 32-lead TSOP version. 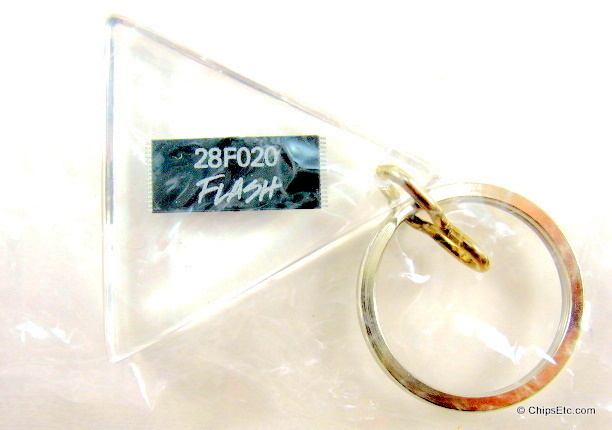 Embedded in this rare keychain is an actual 28F020 Memory chip, it has been custom marked with the Intel logo on back and "28F020 Flash" on the front of the chip.